In 2012, Scots initiated an ongoing program to research the efficacy of teaching strategies. The five Academic Deans were at the fore of this initiative. Action Learning Initiatives (ALI) are projects conducted by teaching staff to introduce and evaluate new learning strategies and programs. There are a number of ALIs underway across the College. The following projects are just some of the exciting initiatives taken by staff at The Scots College to further refine their educational practice. The Scots College is fortunate to have many male teachers in a profession in which men are becoming rare. Over the last two decades, the number of men in NSW public schools has fallen sharply. Today 39.8% of secondary teachers and a paltry 16% of primary teachers are men. Having positive male role models who champion not only traditional male values but also academics and the arts is essential. Scots is well placed to become a strong advocate for male teachers and to inspire young men to enter the profession. But what motivates men to become teachers in a profession that is becoming increasingly a woman’s domain? This question formed the basis of a study undertaken by Mr Stuart Pearson as part of the Scots-Sydney University Masters of Education Leadership Program. The study looked at the factors that influence men’s decision to teach and found that the male teachers at Scots possess a strong intrinsic desire to work with and guide young people, and that the influence of extrinsic factors such as pay and holidays was very small. The culmination of the study was a number of recommendations to support existing male teachers. It also examined how the College might attract male teachers and to encourage our graduates to become part of “… the profession that teaches all other professions”. Mr Pearson’s study has now been published as Issue 3 in the Scots Research Papers Series, and can be read in full here. "Poor performance is not inevitable … Parents and teachers can work together in outlining good habits and ways of getting boys excited about their reading. 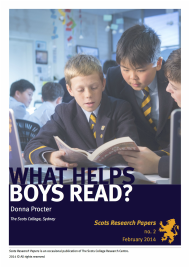 This isn't just about boys reading a novel; it's about encouraging critical and creative thinking skills, which is one of the main components of the new Australian Curriculum," said Ms Procter.The full report on Ms Procter's research project is published in the Scots Research Papers series, no. 2 (February 2014), which can be downloaded here. Leading from the front, Mr Steven Stoneham, formerly Dean of Language Arts, ran an Action Research Project in early 2013 with his Year 10 English Honours class on the teaching of Shakespeare and published the results in a paper. The teaching method avoided the usual class reading of the play over many lessons. Instead, the boys began reading Katherina’s last speech at the end of The Taming of the Shrew. They were then emailed an electronic ‘program’ that asked them to focus on five sections of the play only. The story of the play between these sections was outlined. The intent was to engage the boys in thinking about a concept at the outset of their study of the play. They were to consider the play in relation to the idea of behaviour modification and its moral legitimacy. As the boys read the selected sections of the play, they were challenged with questions. At the end of the five-week unit of work they had to produce an essay stating their case as to whether or not the ‘shrew’ had been ‘tamed’. Each boy answered a survey about the efficacy of the unit of work and the teaching strategy. Data crunching converted their answers to a finding. The teaching approach was found to have been overwhelmingly successful. The Action Research Paper was discussed in English Department meetings and has directed discussion about the most effective ways to teach Shakespeare at Scots.